Konza Technology City is an ambitious 20 year, 2 000 hectare, US$14.5-billion new town project 64 km south of Nairobi, hailed as Africa’s future Silicon Valley. Yet, who will actually live and work in them? Africa is bracing itself for the arrival of the New Cities. That’s the term being used by urban scholars to describe the continent’s next urban phenomenon: Comprehensively planned, independent, relatively self-contained communities, usually built from scratch, and large enough to provide within their borders housing, public facilities, socio-cultural opportunities and employment for their residents. Some scholars have gone so far as to call the New Cities “urban villages,” distinguishing them from a “normal” city that gradually grows and evolves over time. New City projects emerging in Africa are planned urban areas, usually on the periphery of an older city, designed to meet their own residential, commercial, industrial and retail needs. The concept is not a novel one. Over a century ago, Sir Ebenezer Howard’s Garden Cities were an attempt to create new modern cities to right the wrongs of London during the 20th century. Ebenezer’s concept is now being applied in Africa, albeit under new and complex conditions. But of concern is that, with so many New Cities already in the pipeline, still no one knows what their impact will be. A vast urban experiment is underway, with not nearly enough study or forethought as to how these places will affect the economies, environments and lives of people who will live both in and outside of them. Recently ranked third last in the Economist’s urban livability poll, crowded Lagos has high crime rates, unbearable traffic and little infrastructure to support the population. Nairobi will soon welcome Konza, already being hailed as Africa’s Silicon Valley, and Tatu City, a $2.8 billion USD project located just off the region’s new Thika Super-Highway. Just outside of Accra, Appolonia, nicknamed the “City of Light,” is a planned, mixed-use city that broke ground last year and is conceptualized as a “work-live-play” community. Lagos is eyeing the construction of Eko Atlantic, a city for 400,000 built on land reclaimed from the ocean. And Lusaka, Zambia is welcoming Roma Park, a residential and commercial development being built on 118 hectares of greenfield. The list of projects continues to grow as other African cities jump on the bandwagon. This trend in urban development calls for empirical diagnosis and analysis of the opportunities, challenges and implications of these emerging urban forms. Here is the savannah outside Nairobi that one day might become Konza Technology City. Does it ever make sense to plan a city where nothing yet exists? More Connected, Global and Sustainable? Based on the assumption of a shared longing for new urban spaces, these cities come with promises of impressive amenities and functioning systems that will enable the urban lifestyle most Western cities provide. 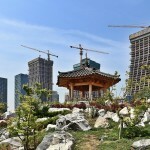 And they’re branding themselves accordingly – they’re sometimes called Eco-Cities or Smart Cities — and boast that they will be more connected, global and sustainable than traditional cities. 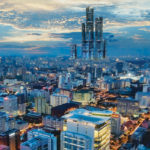 Hope City, planned for outside of Accra, Ghana, would have the world’s tallest building and a technology-based urban center. Rendering by OBR Architects. Originally made of mud brick walls and thatched roofs, compound structures have been a prevalent form of housing in Ghana for centuries, built to encourage communal life. The Hope City towers pretend to use this as a prototype. Really. New Cities are private-sector driven with great support from naïve African governments that want to leverage their personal and political mandates with exciting new ideas. These governments are betting on two things. The first is that an emerging African middle class that will demand (and pay a premium for) high-quality urban space. And the second is that the economic recession in Europe will spur more “urban entrepreneurialism” — due to lack of lucrative opportunities and an already saturated market in Europe, foreign private-sector companies are exercising urban neo-liberalism and place marketing in African cities. But a great concern with these New Cities is that, from concept to construction, they silence or even outright exclude urban planners and managers, local governments and even the citizenry itself. Many New Cities are being built with input exclusively from architects, engineers and property developers. This lack of fundamental technical input from other stakeholders is worrying. For example, Tatu City in Nairobi is set to be developed on prime agricultural land. This land was initially a coffee plantation, which happens to be an important foreign exchange earner for Kenya. This draws in the issue of land use, particularly in countries where there are weak regulatory frameworks and cultural influences on land ownership. These cities also risk exacerbating the problems of spatial fragmentation, and social and spatial polarization. Many African urbanites are poor – Nairobi’s urban poor, for example, are said to be 60 percent of the city’s population. The sustainable agenda inherent in the designs of these New Cities is not feasible for the urban poor. Will informal housing or vending be allowed in these cities? Will the glass high-rises with their expensive cooling systems – functioning against the backdrop of unreliable electricity – exclude those who cannot afford to support these costs? Just outside Angola’s capital city of Luanda is Nova Cidade de Kilamba a residential development of 750 eight-story apartment buildings, a dozen schools, and more than 100 retail units remain largely empty. Photo Courtesy the project’s Facebook page. Though the consequences of these cities are speculative, Africa can learn from recent cases. The most relevant is in Angola. Nova Cidade de Kilamba was built by a state-owned Chinese investment company on an assumption of housing deficits and a need to provide mixed-use buildings in the outskirts of Luanda, the capital city. Today, this development is empty. The neighboring slum dwellers are unable to afford the expensive apartments, and better-off residents don’t want to move away from the central business district’s economic activity and amenities. It is clear that this project was not well thought through. Indeed, it was a fantasy and has remained so since its inception — an ominous sign for the many other New Cities popping up around the continent. Jane Lumumba is an urban practitioner living and working in Nairobi, Kenya. She is currently a consultant at UN-HABITAT working in the fields of urban governance and devolution in Kenya. She is also the co-founder and director of LuMa Africa, a regional firm with capacity building at the heart of its mandate working with a wide range of stakeholders with the aim of harnessing and promoting core capacity-building tools in order to stimulate long-term profits and change.